I was very pleased with Danforth Diamonds, Christy was a joy to work with, it is refreshing to have a knowledgeable person to talk to when you call a company instead of a calling center in India. I would definitely recommend Danforth Diamond to anyone! 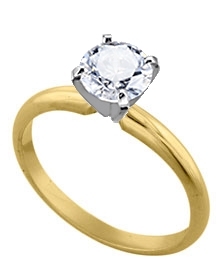 This classic 14k yellow gold 2.8 mm solitaire is ideal for almost any size and shape diamond.